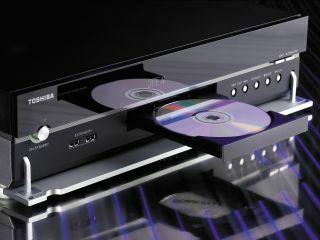 Toshiba's HD DVD spokesman has fought back against claims that Blu-ray is winning the HD format war. In the second part of our exclusive interview Olivier Van Wynendaele - deputy general manager of HD DVD at Toshiba Ltd - predicts that HD DVD may come to dominate in Europe and confirms Toshiba's plans to still launch SED TVs - something that looked unlikely after Canon was forced to buy out Toshiba's stake in the joint SED company they had together. He also suggests that high def disc recorders are unlikely to succeed in the UK thanks to the dominance of Sky HD . One of the chief reasons by HD DVD will succeed - or co-exist with Blu-ray - is because of the major support for Toshiba's high def format by Chinese manufacturers. This seems a strange claim on the face of it as Blu-ray has all the big household brands like Philips , Sony and Panasonic on its side. However this isn't necessarily a big deal according to Van Wynendaele. Van Wynendaele says that 70% of DVD players in UK homes are made by Chinese companies who've come to dominate the sector because of their keen pricing. He argues widespread availability of cheap players from the Far East actually helped the mass adoption of DVD and believes Chinese manufacturers will have the same impact for Toshiba's high-def format. He also points out that HD DVD has already been adopted as the standard for high def playback in China, which could see tens of millions of players sold in the Far East alone. Van Wynendaele does believe, however, that high def discs will be more slowly adopted than was the case with HD DVD. He said there was no point talking of victory in a war that few people - outside the industry - know is being fought. He argues that it's in the interest of both the Blu-ray and HD DVD camps to promote the idea of high definition video playback, and to raise awareness of high definition per se. "They need to know HD exists," he says. He says once people have seen HD DVD - and by extension high def - they're blown away by the picture quality. He says that adoption of either standard won't be as clear cut for consumers as it was in the transition from VHS to DVD. Instead it will be more "step by step." Blu-ray's adoption by the majority of big Hollywood movies studios also doesn't trouble Van Wynendaele. He argues that there is more to film-making and the movie industry than just Hollywood alone. Europe, for example he says, has long been dominated by home-grown movie studios with audiences in countries like France, Germany and Italy preferring domestic rather than US movies in many cases. He cites his native country of France as an example: there he says 40% of movies shown in cinemas in that country are natively produced, with the number one box office draws dominated by French movies. The situation in Germany and Italy is a little different with 25% of movies shown in theatres being native. This is significant, Van Wynendaele argues, because HD DVD authoring studios are already widely established in Europe, and that many domestic European studios - such as Canal Plus and Pathé - are already backing HD DVD for their movie titles. In fact, he says, many European film companies are put off Blu-ray adoption because you have so few places to go to get your movie authored. This in turn means that the authoring process for Blu-ray is expensive, and that content companies are not free to set their own prices, etc. "The eco system is wider for HD DVD," he says. "It's much more competitive." Van Wynendaele also says Blu-ray overplays its hand when it tries to compare the disc capacities on Blu-ray (with 50GB discs dominating) and HD DVD (with 30GB discs dominating). The difference between the two, he argues, is that Blue-ray discs have to have the extra capacity because the default codec used for Blu-ray - MPEG2 - is a lot less-efficient than the MPEG4 AVC codec favoured by HD DVD [although in truth both formats give movie producers the choice of MPEG2, MPEG4 AVC or VC-1]. In any event, he says, Toshiba has now also invented a triple-layer HD DVD with a 51GB capacity. He also believes that HD DVD players will be more future-proof than their Blu-ray equivalents. This, he says, is because all HD DVD players have built-in ethernet connections for the format's interactive features - something Blu-ray currently lacks - and that this connection will enable it to deliver upgrades to users machines in the future. This isn't possible with Blu-ray, he says, leaving you with an expensive player today that could be a lame duck technologically tomorrow. Introducing recordable versions of either format, he says, will also be difficult in the UK in future, largely thanks the dominance of Sky TV, its high-def recording personal video recorder (PVR) and its insistence in copy-protecting its content. Finally Van Wynendaele has confirmed however that Toshiba still plans to launch SED TVs in Japan later this year, and will buy in the SED panels needed to make the sets as it had originally planned.